Rowland School of Business: The school's new name honors the family of benefactors George and Kathleen White. 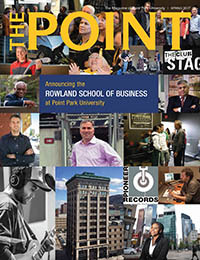 All Business: Read a Q&A and see a video with Steve Tanzilli, J.D., new dean of the Rowland School of Business. Open Seating: Look inside the main stage theater in the new Pittsburgh Playhouse, which continues to take shape in Downtown Pittsburgh. Star Explorer: Professor Brendan Mullan, Ph.D., shares the excitement of astrophysics and more with students. Around The Globe: Student journalists past and present gathered on campus to celebrate the 50th anniversary of Point Park's independently run student newspaper. Home Court Advantage: Read about scholar-athlete Ja'Nia McPhatter's accomplishments on the basketball court and in the classroom.